After long weeks of preparing the Indigo Awards, I flew to Singapore to attend The Annual SDP Asia Summit. The invitation was given by Andy Zain and Andreas Surya of Indonesia Mobile-Monday (id-Momo). I have a couple times talked about SDP with them; and also presented it once in FRESH forum. 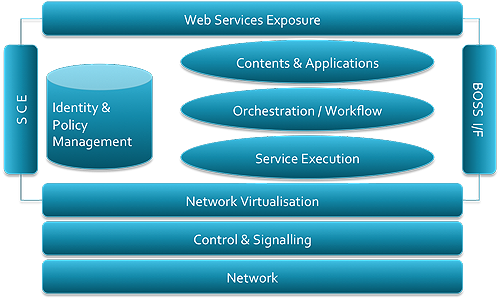 SDP (service delivery platform) itself is a framework to virtualise network & orchestrate services to make it easier to develop, deploy, sale, get, & use digital services. Unlike IMS, so far there is no standard of SDP. This fact somewhat makes SDP discussion interesting: it is about best practice in infocom business. Since SDP has no standard, companies could easily make a concept of SDP 2.0 (ala Accenture or Telecom Italia) or even SDP 3.0 (HP version). Also there were some alternatives to map SDP to other infocom management concept, such as SOA, SDF, IMS, and even Web 2.0. When describing the architecture of SDP 2.0, Telecom Italia explores the necessities for service & network abstraction & virtualisation, including reusability and interface standardisation. Scalability & modularity would include plugins capability. Sounds a bit like Accenture version (I have blogged this version in my Indonesian blog), where the objective of SDP 2.0 is to facilitate a self-service for service developer & provider in commercializing their services & contents. But then Hewlett-Packard introduces this term: service governance framework. It encourages the use of open standard, reusability, and other issues to ensure an effective SDP implementation. Other issue delivered is the utilisation of data mining toward users profile, applications, etc, etc, to make it SDP 3.0. In the similar spirit, Telemanagement Forum discusses the linkage to business: SOA, SDP, Web2.0, etc, mainly SDF. Great pictures, indeed. They somewhat remind me to C++ standard template library. Discussions with operators, providers, & consultant who are in progress of implementing SDP in Asia & Europe make the days richer. I guess then I need to make a presentation to summarize them all, and present it to my colleagues this week. Hmm, maybe after the IEEE 4G session(s).